Home » Futbol Versus Football: Who's Got The True Super Fans? Recently, I had a chance to go to Barcelona, Spain on a business trip with my husband. It was my first trip to Spain, and I was excited to see and experience everything the gorgeous country had to offer. For me, the best part of travel is to experience new things and compare the similarities in culture back home in Texas. Our trip took place smack in the middle of soccer season: Spanish soccer, European soccer, and for that matter WORLD soccer. 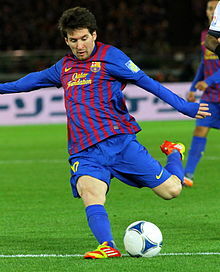 FC Barcelona (and its superstar, Lionel Messi, pictured below right) was playing Real Madrid in the second leg of La Liga's premier matchup, El Clásico. It was a "winner take all" game. My husband, who is a huge world soccer fan, was in nirvana. I love sport and competition, so I was happy to participate, too. We are well versed in being in the right place for the big game. In college football, Dallas is Mecca for the Texas-OU game. It is a huge interstate grudge match. The winner has bragging rights to the Red River, and in some years, the game has national title implications. The game takes place during the annual Texas State Fair, which lasts three weeks. The build up, the game and the post-game takes up at least two of those three weeks. We are also well versed in the exuberance of European soccer fans. We have an Italian family member who lives and breathes his Italian soccer. In 1994, mere months before his wedding, he was in stunned silence for days after Italy fell to Argentina in the World Cup final. We worried if he would recover in time for the ceremony. He did. When Italy won the World Cup title in 2006, he celebrated day and night in London for a week. In fact, I think we celebrated for an entire 4 years, until the Cup went out "on loan" again (this time to Spain). Note, that I am trying to be delicate and not use the "L" word! Game day found us happily travelling in the Spanish countryside. We were soaking up - if that's the right word! - the country's beautiful wine, produce and architecture; much of what the Romans had left behind before they discovered soccer! The town was decorated in Barcelona colors and looked ready to have a fiesta like no other. We asked our innkeeper where we might watch the game. She replied that all stores would be closed, as the game was to be watched with family. Since we were staying at her inn, we were family, so we would watch in the hotel lounge. One thing though: her family was divided! Some were for Barcelona and some were for Real Madrid. Good to know before we embarked on a delicate diplomatic mission of staying neutral. Back home, some families have both UT fans and OU fans. You tread lightly in October. We knew just what to do. We arrived prior to the game time, wearing neutral colors. I asked in my best "Spanglish" if I was needed (Neccisitame) to help (ayudar) in the kitchen (en la cocina). Our hostess, in English, explained that no help was needed. In fact, she told us her stomach was "too nervous to eat during the match." WHAT??? Where were my Spanish-equivalent wings, queso, chips, ribs, etc.? The food that makes the game, well, THE game! We scrounged up some almonds and there was lots and lots of wine. At the beginning of the second half the game was tied, 1-1. 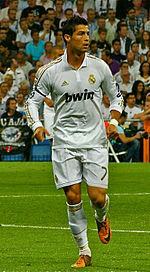 I was drifting in and out (no, not passed out) when Christiano Rinaldo scored from 30 yards out for Real Madrid. I will say he does put the beautiful in the beautiful game. It was over for Barcelona. My husband and I were working the room between "BRAVO" and "FORTE" for our Madrid friends and "Dios Mio" and "Lo Siento" for our Barcelona friends. There were lots of hand gestures, too. Okay, so Barcelona lost, let's go on to the party and find something to eat and talk about next year. We Longhorn fans have had to do this on occasion! My husband and I went out into the festive streets only to be greeted by complete silence. No one was going anywhere. It was a ghost town. A few mournful barks from dogs inside townhouses was all we heard! We staggered into a restaurant only to find NO ONE there. A weepy man and wife welcomed us to sit and served us a fabulous and lovely dinner, but we dined alone. We walked back to the Inn in a town that the party forgot. The next morning, we hoped to find our adopted town in happier spirits. We were exploring close to the center of their town: their local church. A slow, sad, military march-style song was playing over a loudspeaker that echoed through the entire town. My husband and I looked around a little stunned and shocked. Then the mournful music was interrupted by a voice bellowing out in an equal sad voice. I am not 100% certain, but I think he was saying that church was cancelled! It was time for church to begin, but no one was moving toward the church in the middle of the town. We only say "Football is Religion" in Texas; In Spain, apparently, there is a chance that Futbol is more than religion! We bid good -bye to our new friends, both Barcelona and Madrid fans and headed back to Barcelona. The city seemed a little sluggish. The FC Barcelona shop was closed and folks were quiet and solemn. We worked our way up to the site of 1992 Olympic Games which Barcelona hosted so graciously. The city had seen so many conquerors and defeats, wins and losses, perhaps it was its custom to devote a few days to silent reflection. On the television news, it looked like the folks in Madrid were still celebrating, days after Real's win. Futball or football, baseball, or golf, this is the month for men to be loud and be proud for your team and your country. Sports is the shared emotion and culture on this planet. Show your team spirit in the Euro Cup and the Olympics. Do not hold back, but please, please bring some food to the celebration! Gretchen Rose is a wife and mom of a teen and tween in Dallas, Texas. She and her husband are owners of KidzMat, the premier organizational equipment for all youth sports teams. She is a frequent MomsTeam contributor.